How to enjoy Venice with a wheelchair, walker, crutches, or cane. 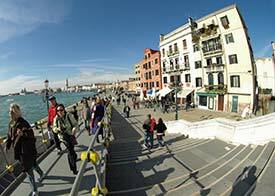 ABOVE: Venice's waterfront promenades (such as the Riva dei Sette Martiri, shown above) sometimes--but only sometimes--have wooden ramps on their bridges. Disabled travelers are frequently intimidated by Venice. The city was built long before "equal access" became part of the architect's vocabulary, and the city is dotted with hundreds of bridges that require climbing and descending steps. It's no wonder that many physically disabled tourists are tempted to skip Venice when traveling through Europe. And that's a shame, because it's certainly possible to enjoy Venice with a wheelchair, walker, or crutches if you know what to expect and plan your touring strategy accordingly. The not infrequent acqua alta or "high water" between late October and early spring is another thing to consider. When high tides and winds in the Adriatic push water into the Venice Lagoon, the result is flooding of St. Mark's Square and other low-lying areas. Pedestrians can don rubber boots or step onto temporary wooden walkways, but if you're in a wheelchair, you could be stuck in your hotel for a few hours until the tide goes down. Step 2: Visit the Tourist Office. The Azienda di Promozione Turistica, a.k.a. the Venice Tourist Office, publishes free maps and brocures for disabled travelers. You'll find branch offices beneath the arches at the western (enclosed) end of the Piazza San Marco, at the Venice railway station, in the arrivals hall at Marco Polo Airport, and at various seasonal locations around town. A few bridges, such as the Ponte delle Guglie (shown on the next page), have special half-height stairs that can be negotiated in wheelchairs. A sign warns that a companion is required--and after watching porters struggle with delivery carts on the bridges, we'd be inclined to second that precaution. The railroad station has a long flight of steps leading down to the water. However, a sloping paved path connects the train platforms with the waterfront. See our page about handicapped facilities at Venice's Santa Lucia railroad station. ABOVE: Ponte delle Guglie bridge. 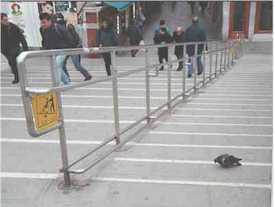 The steps on the right are half-height with rounded edges for easier negotiation by wheelchair travelers with companions. Step 3: Buy a vaporetto tourist travel card or a supply of "disabled tickets." ACTV, the Venice transportation authority, offers one- to seven-day tourist travel cards that allow unlimited travel on any of the city's water buses. You can buy these at the ACTV office in the Piazzale Roma or the vaporetto ticket booths near the railway station, the Fondamenta Nuove, the Piazza San Marco, and other locations. Another (and more expensive) option may be the Venezia Unica tourist pass, which offers an a la carte package of vaporetto transportation, public toilets, admission to municipal museums, optional roundtrip transportation on the Alilaguna airport boat, and other perks with a frustratingly complicated pricing scheme. Finally, passengers with wheelchairs can buy single-fare "disabled tickets" at heavily-discounted rates from ACTV ticket booths and Hellovenezia offices. Each ticket is valid for 75 minutes, and a companion travels free. This strategy works especially well on the Grand Canal, the Giudecca Canal, and the Lido, where the No. 1 and No. 2 routes are wheelchair-accessible. The No. 1 vaporetto is the most useful, since it zigzags from one side of the Grand Canal to the other on its 20-stop journey from the Piazzale Roma to the Lido. As the photo shows, this water bus can be crowded during the tourist season, but the conductor will usually clear a path for you, and the crew will help you on or off the boat quickly and without fuss. About two-thirds of the vaporetto lines are fully wheelchair-accessible; a few are not, although wheelchair-accessible boats are being introduced on the circolare lines that use split-level motoscafo boats. Fully-accessible lines are marked in our illustrated article on Vaporetto routes. Step 4: When in doubt, call ahead. Most churches are accessible once you get inside. The tricky part may be in getting up the steps, but this can be managed if you have a strong companion or aren't shy about bumming a lift from athletic tourists or locals. Other buildings, such as museums, may vary in accessibility. The most impressive rooms in the Scuola Grande di San Rocco, for example, require climbing a long flight of marble stairs--unless you use the special wheelchair with motorized rubber treads, which lets you assault the staircase like an army tank. Your best bet is to phone before you go, so you can make other plans if the building requires a sturdy set of lungs and legs. First, scroll to the bottom of this page for a mini-map that shows wheelchair-accessible routes in the city center. If you're looking for a place to stay, see our Accessible Venice Hotels article, which lists wheelchair-friendly hotels near the Piazza San Marco, on the Grand Canal, and by the Piazzale Roma (Venice's terminus for airport buses, taxis, cars, and the People Mover to the Marittima cruise piers). The City of Venice has accessible Venice pages with general advice, an accessibility map in PDF format, a selection of barrier-free itineraries that are mostly up to date, lists of businesses that rent wheelchairs and accessible motorboats, and other useful information. You can also pick up a printed Accessible Venice kit in Venice or Mestre. Sage Traveling, a site that provides information on disability travel in 40+ European cities, has a useful "Wheelchair Accessibility on Venice's Vaporetto" page with photos. Another handy resource is the Venice page of Accessible Europe (see below), which--among other things--tells where to find accessible WCs and parking. Don't miss Jon Read's Wheelchair Travel Tips for Venice, which he shared with us by e-mail in December, 2010 (and which we published in our Venice Travel Blog). Jess Simpson has written a piece for Fodor's Travel titled "Navigating Car-Free Venice with My 93-Year-Old Grandmother" that describes a trip to Venice with a slow-walking (but still walking) lady of advanced years. Finally, if you'd like to take a gondola ride in a wheelchair, book ahead with Gondolas4all (which has a custom-built pier with a wheelchair lift near the Piazzale Roma). "I am originally from New York and now live and work in Florence, Italy. I am with the specialized tour operator Regency San Marino SRL. We arrange group and individual travel in Italy for individuals with disabilities. We also can organize personalized itineraries for individuals, depending on their interests. "We work with accessible coach buses, minibuses with tie-downs, and hotels with roll-in showers. We also visit accessible museums and restaurants and offer rentals of wheelchairs, electric scooters, and portable suitcase ramps. Your readers are welcome to visit our Web site and contact me for further information about our services." Another firm, Accessible Europe, has been serving disabled travelers since 1993. Massimo Micotti's company offers tour packages in Venice, Florence, and Rome that include transfers and half a day of guided sightseeing. Other services include transportion in accessible vans, rentals of self-drive cars for disabled travelers, wheelchair and scooter hire, help in obtaining dialysis or oxygen, etc. This excerpt is taken from an old Venice Tourist Office map of Venice and the Lido. The yellow areas are wheelchair-accessible.